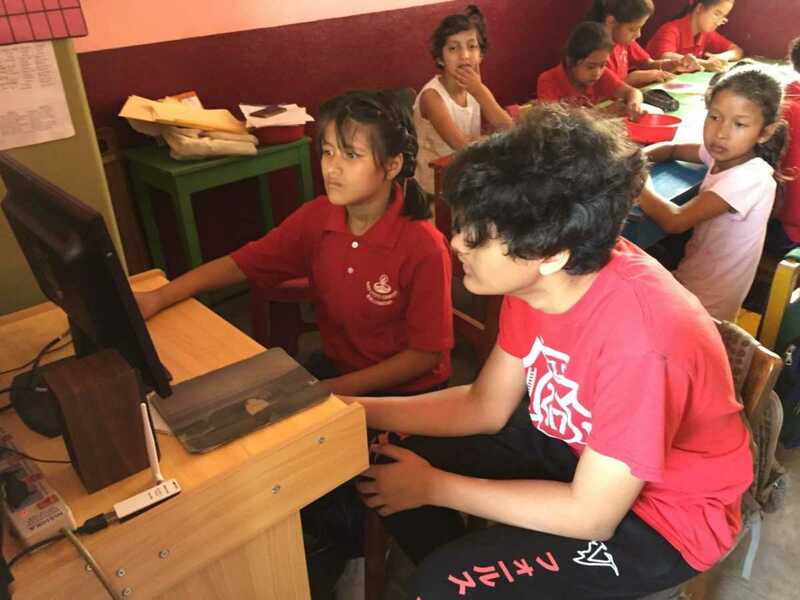 Amit Adhikari, a senior at Covington Latin School, a co-educational Catholic college-preparatory high school in Covington, Kentucky, went to Kathmandu, Nepal, to volunteer with the Sisters of Charity of Nazareth at their school for students with special needs. He wrote about his experience for Cincinnati.com. “Asia is home to many extremes: weather, population, religion, and development. Focusing on the last one, there are cities such as Seoul, that represent the better extreme of development, or areas such as the Terai in Nepal, where even hot running water is almost unheard of. Unfortunately, in a digitizing world, areas such as these can quickly fall behind and never recover. More on Nepal, it has been on the United Nations’ Least Developed Countries list and has been since 1971. Nepal has only been excluded 16 out of the almost 63 years it has been in the UN. Getting out of the Least Developed Countries list is difficult, almost impossible, without a major overhaul of its government and economy. “Fortunately, with the advent of computers, IT has been a massive opportunity for all people to get a job and help contribute to the economy. Kathmandu and other major cities have been beacons of hope for previously impoverished citizens to seek an education and better their lives. However, for some people learning is difficult, due to various illnesses or disabilities. The world can be unforgiving to the afflicted, especially in traditional schools. “In Baluwatar, Kathmandu, there is a school dedicated to helping those who have these disabilities. The Navjyoti Centre was founded by missionaries in order to help these people. During my trip to Nepal in June of 2018, I went and volunteered for two weeks to teach the children computer skills. I chose this location because it is close to where I was born in Nepal and I have some experience in helping disabled children with school. I also wanted to help my peers in Nepal, as they are going into the same future I am, and helping them would enrich me and them. Furthermore, I have great experience with computers, having used them for over 80% of my life, and being the “tech-expert” in my family and in my community. “The first thing I encountered when entering my classroom was the cheerful greetings of children. They all introduced themselves and said they were looking forward to learning how to use the computer. I picked out a student that looked eager and took her under my wing for the day. I first started with the basics, what a computer is, what it can do, and why it’s useful. Secondly, I taught her what a mouse is, what a keyboard is, and very quickly confirmed that she knew the alphabet. After the very basics, we moved on to typing, which is good for motor skills and English. I had her type random words coming from a category, like fruits, or countries, or cities. After she was bored with typing random countries, we moved on to drawing, or at least the amount of drawing you can do with Microsoft Paint. I taught her the shapes, the tools, and how you can use them to draw squiggles on the screen. This helped her reinforce shapes and what they look like, while also having fun. “After a few days of the same thing, we went on to typing full sentences, with the help of TypeRacer. Since TypeRacer is automated, the free time let me help other children with their work, such as writing or math. I not only taught computer skills but also taught English, such as writing full sentences and answering questions. “I first contacted the Sisters of Charity of Nazareth through their website. I found their international page, with a complete list of their ministries in other countries, the US, India, Belize, Nepal, and Botswana. I saw Nepal and I had my father contact the center. My father and I communicated with Sister Lisa, the head of the center in Kathmandu, to work out a time slot for me. She was very gracious and even allowed me a week off to visit my grandparents and family in other parts of Nepal. “I had a good experience with the center. They had nice teachers who showed care for their students and did everything they could to help them. Amit, thank you for giving those dear kids “a hand up.” I was in Kathmandu years ago working at an orphanage and loved the children and the Nepali people. They are in such great need of help at all levels. Sharing your skills is such a blessing to them. Amit! A wonderful story of reaching out and making a difference! I am going their to work with both the women and children next week! I too have been communicating with sister Lisa Also! If u have any tips for me as I leave next week sep 30, please reach out Thank you! Amit, thank you for showing us that young students like you want to serve others. I congratulate you for wanting to spend time in service for others. Amit, your personal story was so interesting to me for several reasons. I met a young cousin at a recent family annual Homecoming who told me that she attends Covington Latin School!! When I was teaching in Ludlow, KY years ago, girls did not attend that school. She is the young daughter of Jonathan Thornberry. If you ever meet her, maybe you can inspire her to volunteer in the missions… when she is older. Thank you. Thank you, Amit, for your willingness to use your skills to help those that have not had similar opportunities. May you continue to enrich others and be enriched yourself through them. Thanks Amit for sharing your personal experience with the children in Nepal.I am happy you enjoyed your few days with the kids.May God bless you and your generous heart .